The WofW is not of God, it is of Joseph Smith. It is not even correct. Green Tea is one of the healthiest drinks on earth, yet LDS can’t get a recommend for drinking it, even though it has less caffeine than Coke (GT has around 30mg). Does that make sense? Also, when I lived in the dorms at BYU, you couldn’t buy a coke with caffeine, but you could buy No-Dose which has 200mg of caffeine per dosage. The WofW should just stick to harmful drugs and alcohol consumption and get rid of the bogus caffeinated beverage nonsense, and you are also correct about the meat/grains thing. Just look around at all the overweight WofW breakers in your congregation…all with current temple recommends. Well I’m a follower of no alcohol and no tea/ coffee etc . For me personally my fitness levels and speed improved in my running times . But despite my conclusion the church isn’t what I’d been misled into believing , I’m happy to be alcohol and coffee free . I have read about the Temperance movements at the time when Joseph Smith got his WOW revelation .It seems to me that he’d just grab anything current at the time and claim it was Revelation .He did this from the very beginning starting with his BofM. Jay .. I’m on Zelphs Skeptical Mormon blog mostly . Come and have some input there . I wonder how you are coming to terms with the church . Interesting that you could buy No Doze at BYU. I never even noticed it there. 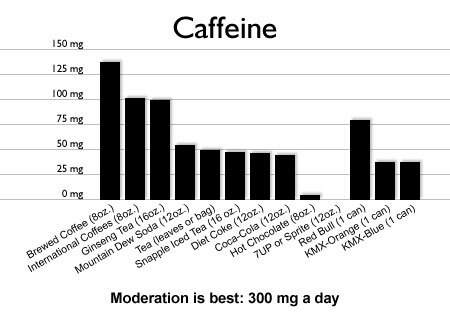 But it just goes to illustrate how confused everyone is about the “no caffeine” thing. Thanks for the links. Just one thing made me wonder how accurate they are being at CaffeineAwareness.org. They say the caffeine has been linked to increased heart problems. As far as I know there has been debate about this. Some studies do show an increase, but others do not. The fact that they only mention that it IS for a fact connected makes the rest of their site suspect. Though I would definitely recommend the site to a heavy caffeine drinker so they could learn how it affects them. I also think it is better to avoid coffee, tea, alcohol, drugs for health reasons. I do visit Zelph’s blog occasionally. Zelph and I are similar in many ways, although I think he has come down a lot harder in critiquing the Church than I have (I think his blog is great by the way). I think it is interesting that he still holds his calling and attends sacrament meeting, but doesn’t believe anymore. It sounds like he’s become a new order Mormon. I’m not sure where my struggles are taking me yet. I’ve kind of laid off the torment of thinking about it for a while so I can concentrate on other important things. It is always in the back of my mind though. I continue to listen to podcasts and read blogs when I have the time. Eventually, I’ll have to make a decision about what I’m going to do. Perhaps that will happen next year when my son’s baptism approaches. I don’t know what the Bishop will say to me sense he knows now how I feel. I really don’t have a problem baptizing him if the Bishop will let me. Anyway right now I have to just let the controversy go and leave it in God’s hands until I have more personal time to do my own in-depth study of the issues. You are a good person .In my nearly two year investigation of the Mormon church , I have decided that its not what it claims to be .You probably already knew this from my somewhat aggressive tone on occasion . I feel comfortable in my research knowing that yourself as a faithfull Mormon have come across many of the things which made me decide not to join and cause you to question things . I feel my thoughts and findings are valid and that the LDS Apologetics are too full of excuses and spin to evade the real truth of things . I also dislike the way the Apostles remain silent on these issues and will let BYU apologists deal with them while claiming not to speak for the church . Thats like me sending out someone to steal for me and the thief claiming not to represent or have anything to do with me . To make things worse SHIELDS now prefer to ignore my enquiries and Greg Dodge ( head of LDS Church Records ) has ignored my letter of over a month ago enquiring about the rate of annual church resignations . Its obviously a church which prefers not to be upfront about anything .Members are taught to be honest while church leaders believe its their duty to be somewhat dishonest about Historical Events . If there was ever a church which I could have been at home in , then Mormonism is the one it would have been . I do feel kind of sad , but Real Truth is more important . I couldn’t share this gospel with a view to proslytising knowing all the things I would be keeping hidden from a potential convert .My concience wouldn’t allow it . I am happy to share details of Mormonism and its beliefs and history with friends and family .This way rather than proslytising means my conscience and Integrity as an honest seeking person can be upheld and they get to know the real version of events . I couldn’t tell someone about the translation method without informing them of his hat and stone and his face staring inside it. I couldn’t tell someone about The Indians being the descendants of Lamenites without informing them of their real Siberian/Mongolian Ancestry . I couldn’t share happy monogomous families knowing that Polygamy is the real order of things in this church . I couldn’t even talk about Brigham Young positively knowing all the nonsense he spoke in conferences and recorded in JOD’s. So there is the problem I’m having in joining and I guess its the same problem you’re having about staying in . At some point I will have to stop being a Social Cultural Mormon Investigator and it will be very heart breaking for me as well as some in church . What about decaf coffee and tea? Decaf still has somewhere around 3% caffeine, but I have ask the same question myself. I know many LDS members that will not blink an eye at drinking a Mountain Dew (myself included), but wouldn’t dream of taking a sip of decaf coffee. One answer I’ve gotten is that caffeine isn’t the only reason coffee is bad for you. There are other chemicals that harm your body. This may be true, but that’s not the impression that most LDS members have and I’m not even sure to what extent those “other chemicals” are really bad for you. Most of members and non-members believe it is the caffeine that spoils coffee. I think the only honest answer LDS members can give is that they avoid coffee because they believe that is what God has asked them to do. They love Him, so they do what He asks. Any other answer leaves loopholes. I’m willing to admit that I may be wrong for my consumption of an occasional caffeinated drink, but unless it’s a daily indulgence I don’t think it’s really defiling my body. My last caffeinated drink was a week ago and I can still live with myself. The fact that you and many other LDS can drink Mountain Dew without blinking and eye suggest to me that the ban on coffee is really more of a cultural restraint rather than a spiritual restraint. Hey, that analogy is pretty rough, but I get your point. Personally, I don’t think caffeine or no caffeine is really the issue. The real issue is how we take care of our bodies. Do we abuse them by let’s say ingesting highly caffeinated drinks on a daily basis, over eating or being a junk food junky? I am against drinking Mountain Dew on a daily or even weekly basis. It is sad to me that some people become so dependent on the morning coffee routine that it actually affects their mood and work performance. I’ve seen that it can be a difficult addiction to break. At the same time I think it is strange that if I drink one cup of decaf coffee before my interview I cannot have a temple recommend, but a 20oz bottle of Mountain Dew is OK. It begs the question; if it’s not the caffeine that is objectionable, what is it? I flat out told my Bishop I drank coke and other caffeinated drinks and he brushed it off like it didn’t matter. This was after President Hinckley’s famous appearance on Larry King live. I will admit that I didn’t bring it up to the Stake President. I think next time I will to see what happens. Nevertheless, if the issue is important enough to be a weeding tool for worthiness, the LDS leadership should clarify the confusion so that members can know what is required of them. One way to do this is to stop allowing members that drink caffeinated beverages from getting a temple recommend. That will send the clear message that it is not acceptable. However if they did this I think temple attendance would decrease dramatically. This is probably why they’ve taken a more subdued approach to the problem (i.e. Hinckley telling members that they don’t drink caffeine on National television) instead of facing the problem directly. Perhaps they feel that they can gently coax the caffeine sinner back into the right path through guilt. I prefer a more direct route myself. It eliminates confusion. 1. The WoW’s purpose is obedience, if we study about the revelations of God, all the time *God* had given a WoW, where certain food was banned, since Eden to the Law of Mosses. So it’s not really that certain food is poison for your body (even when too much could be) but if you think it’s a commandment then it turns to be poision for your soul. Taking from there, the revelation NEVER talk about caffeine, but TWO beverages. And even in Joseph Smith’s time there was hot cocoa, so why the ban was for the coffee and tea? 2. If caffeine is in the spirit of the law, then every mormon maybe is under damnation. There are mormons who never taste chocolate in his lifetime?I do recall speaches of Pdte Hinckley and Monson where they ate/drank chocolate. All that is just aside of Joseph Smith’s position about this law and the indulge of some in his time to “brake” it. yeah that analogy was a little rough. Sorry if it offends anyone. I thought of another from my own past. I went to a church that prohibited members from going to movie theaters regardless of what kind of movie it might be. But we could rent all the movies we wanted. I agree that teaching the virtue “take care of your body and avoid all addictions” is MUCH more valuable than “don’t drink coffee”. I’m convinced that this was Jesus’ ethic. The caffeine thing is my biggest question. I have asked soooooo many members and I always get a different response. So many who would never break a command DRINK soda! And then there are soooo many who say NO CAFFEINE! For a newer member this is quite confusing. I don’t drink soda and I don’t allow my kids to, but I would still like a CLEAR answer! BUT this issue would never turn me away from the church, neither would any other issues for that matter. I plan on writing the Prophet and I hope to get a response back, when and if I do I will let you know! If you get an answer I would be very interested in knowing. My guess is that you will get a general answer. Something along the lines of that’s between you and God or that it is against the spirit of the word of wisdom. You will not be told directly to not drink caffienated drinks. If you send a letter to the Prophet he may just send it back to your Bishop and ask him to talk with you. It is not such a touchy subject as it is a confusing one. There have been mixed messages from leaders. Please do let us know if and when you get a response. I think a lot of people would like to know what the official stance is. Probably a bit of topic really but it is kind of related. What about D&C 89:17 and barley… for mild drinks, as also other grain. What is a mild drink made with barleys and other grain (remember strong drinks are defined as “spirituous liquor” by GA’s a number of times). There have been GA’s (mind you not for a long time) who considered Beer Ok according to this. I don’t have the quotes on me but in the early 1900’s Apostles Brigham Young Jr and John Henry Smith argued beer was OK. What are your thoughts? As an introduction I am a member of the LDS Church, Temple married, two sons (one on the way) and live in Australia. I don’t know the answer to this but I want to know. I’ll ask around and see what I can find out! As I’m sure you know, the Word of Wisdom has not always been “enforced” (i.e. not being able to get a temple recommend). Early LDS members drank coffee, alcohol and smoked. Joseph Smith and his family were no exception. I’m not exactly sure when it became “required” to live the WofW, but it wasn’t always that way. So it would not surprise me if you were able to find quotes of Prophets or Apostles that tried to justify drinking beer, but clearly in todays LDS church this is prohibited, if you want to have a temple recommend that is.